The 1964 Pacific typhoon season was the most active tropical cyclone season recorded globally, with a total of 40 tropical storms forming. It had no official bounds; it ran year-round in 1964, but most tropical cyclones tend to form in the northwestern Pacific Ocean between June and December. These dates conventionally delimit the period of each year when most tropical cyclones form in the northwestern Pacific Ocean. Tropical Storms formed in the entire west pacific basin were assigned a name by the Joint Typhoon Warning Center. Tropical depressions in this basin have the "W" suffix added to their number. Tropical depressions that enter or form in the Philippine area of responsibility are assigned a name by the Philippine Atmospheric, Geophysical and Astronomical Services Administration or PAGASA. This can often result in the same storm having two names. The 1964 Pacific typhoon season was the most active season in recorded history with 39 storms. Notable storms include Typhoon Joan, which killed 7,000 people in Vietnam; Typhoon Louise, which killed 400 people in the Philippines, Typhoons Sally and Opal, which had some of the highest winds of any cyclone ever recorded at 195 mph, Typhoons Flossie and Betty, which both struck the city of Shanghai, China, and Typhoon Ruby, which hit Hong Kong as a powerful 140 mph Category 4 storm, killing over 700 and becoming the second worst typhoon to affect Hong Kong. 52 numbered tropical waves formed this year in the Western Pacific, of which 39 became tropical storms. 26 storms reached typhoon intensity, of which 7 reached super typhoon strength. The season's 39 tropical storms is the most recorded tropical storms to form in the basin. The South China Sea saw higher than normal activity in 1964 – between the years 1959-1963, the average was 3.2 typhoons to travel the area, compared to the 10 typhoons in the 1964 season. Two of the super typhoons, Sally and Opal, set seasonal records - Sally was strongest storm of the season, reaching a pressure of 894 mbar while Opal was the largest system of the season. Five typhoons performed cyclonic loops this season; only two or three happen on average yearly. Kathy did a rare move by executing a second minor loop while undergoing the first loop. Another unusual phenomenon that occurred during the 1964 season was rapid degeneration of typhoons. Notable ones include Alice, Elsie and Cora which degenerated into tropical lows within hours. No apparent reason has been found to this rapid degeneration event. The first tropical cyclone of the season was initially identified by the Joint Typhoon Warning Center (JTWC) on May 9 near Woleai Atoll. Tracking steadily west-northwestward, the system gradually organized. Early on May 14, the system had become sufficiently organized for the JTWC to classify it as a tropical depression. Over the following four days, the depression moved erratically, executing two loops, and fluctuated between tropical storm and tropical depression status. During the morning of May 15, the system had intensified into a tropical storm and was given the name Tess. The developing storm eventually retained an east-northeastward track by May 18. The following day, reconnaissance aircraft recording data on the storm discovered that it had developed two eyes. The first and innermost eye was unusually small, measuring 6 mi (9.7 km) across while the second was asymmetrical, measuring roughly 14 mi (23 km) by 9 mi (14 km). Upon finding this feature, Tess was estimated to have attained typhoon status. Gradual intensification took place over the following few days as the storm turned more northeasterly. On May 22, Tess attained its peak intensity with winds of 155 km/h (100 mph) and a barometric pressure of 960 mbar (hPa). However, by this point the typhoon was moving over higher latitudes and into a less favorable environment. The following day, Tess had significantly weakened to a tropical storm and the center of the storm became exposed. 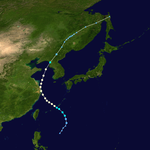 Later on May 23 the typhoon became extratropical as it moved over the north Pacific. Tropical Depression 02W was a short lived depression forming just south of Guam on May 16 and moved to the northeast dissipating within 18 hours. Only four advisories were released on Tropical Depression 02W. Tropical Depression 3W formed on May 25 near Manila. The depression became Tropical Storm Viola the same day, and then Typhoon Viola on the 27th. Viola peaked at 80 mph (129 km/h) winds with a pressure of 980 mbar. The typhoon made landfall in Hong Kong on May 28, dissipating soon after. Striking near Hong Kong as a tropical storm, Viola brought heavy rains and strong winds to the region, ending a two-year drought. Business was nearly brought to a standstill as roads were blocked off and transportation suspended. Several fishing vessels ran aground and 28 people were injured. Additionally, thousands of people living in "junk" houses were left homeless. A total of 100 people were killed and over 500,000 were left homeless throughout the Philippines due to the typhoon. Thousands of poorly constructed homes were destroyed and the capital city of Manila, home to over 2.5 million people, was paralyzed by the storm. The entire city suffered a blackout from Winnie, and officials reported that it would take days to begin restoring power. High winds downed large billboards and tore roofs off many structures as well as uprooting trees. Thousands of residents were left homeless by the storm. Torrential rains triggered widespread flooding throughout the affected region, isolating several communities. Sea and airports were closed for several days due to the system. Damage from the storm were estimated to be in the tens of millions, making Winnie the worst storm to strike the country in roughly 30 years. Tropical Depression 6W formed on June 29 from the remnants of Typhoon Alice in Bicol Region, Philippines. The depression never strengthened into a tropical storm and dissipated four days later on July 2 in Guandong, China. Tropical Depression 10W formed on July 13 west of Saipan. Slow strengthening occurred, thus 10W did not reach tropical storm status until the 15th and was given the name Elsie. After reaching tropical storm status, moderate strengthening occurred, as Elsie reached typhoon intensity on late on the 16th. Rapid strengthening finally occurred, reaching a peak of 100 knots (115 mph) on July 17 and soon made landfall in The Philippines. Elsie weakened and dissipated over water on the 18th. Tropical Depression 11W formed out in the open Pacific Ocean on July 21 and moved west. The depression dissipated on July 23 east of the Philippines, without making landfall. In Okinawa, rough seas from the storm led to the collision of two U.S. Navy vessels and another to run aground. Damage sustained by the ships was reported to be minor. In South Korea, two fishermen drowned and a third was listed as missing after the typhoon brushed northern portions of the country. Offshore, 15 fishing boats were destroyed. The apparent 16th system of the 1964 typhoon season was recorded to be the reformed Tropical Storm Grace on August 3 and 4th. Tropical Depression 17W formed on August 10 in the open Pacific Ocean. Slow intensifying occurred, and 17W was given the name June. June quickly peaked at 45 mph (72 km/h) and dissipated on the 13th north of Luzon. The 19th tropical depression of the season formed on August 10 northwest of Wake Island. The depression soon rapidly strengthen into a tropical storm and was named Kathy by the next day. Kathy continued to gain strength and was a typhoon later on the 11th. From August 15 to August 18, Kathy had a Fujiwhara interaction with Typhoon Marie, soon absorbing Marie on the 18th. More strengthening occurred and Kathy was a Category 4 typhoon by the 18th, peaking at 135 mph (217 km/h) winds. After then, Kathy made a secondary loop before forming a complete loop. After Kathy looped twice, weakening occurred and Kathy made landfall as a tropical storm in Japan on August 25, dissipating soon after. Tropical Depression 18W formed northwest of Saipan on August 12. Strengthening occurred slowly, reaching tropical storm status, receiving the name Lorna and dissipating the next day at a 40 mph (64 km/h) tropical storm peak. Tropical Depression 20W formed far west of Hong Kong on August 14. Strengthening was slow and 20W was given the name Marie the next day. During the storm's lifetime, Marie had a Fujiwhara interaction with the stronger Typhoon Kathy, causing Marie to weaken after peaking at a 80 mph (129 km/h) typhoon and making landfall in Iwo Jima on the 17th. Marie made landfall in Japan on the 18th and was absorbed by Typhoon Kathy the same day. Tropical Depression 21W formed far northeast of Wake Island on August 17. The depression strengthened and was given the name Nancy. Nancy peaked at a 40 mph (64 km/h) tropical storm, dissipating over water on August 19. Tropical Storm Olga was spawned by the 22nd tropical depression of the season forming on August 23 in the South China Sea. Olga dissipated on August 25, not strengthening farther than a 50 mph (80 km/h) tropical storm or ever making landfall. Tropical Depression 23W formed on August 25, never reaching tropical storm status, and dissipated the same day as it formed. The location of this depression is unknown. Tropical Depression 24W formed on August 25 as a 25 mph (40 km/h) depression southeast of Wake Island. The depression quickly strengthened, peaking at a 60 mph (97 km/h) storm named Pamela the same day. Pamela weakened rapidly and was gone by 1200 UTC August 26. Typhoon Ruby, which formed on September 1 to the northeast of Luzon, rapidly intensified on September 5 to a peak of 140 mph (230 km/h) winds. It hit near Hong Kong, causing sustained hurricane winds there just hours later, and dissipated on September 6 over China. Ruby caused over 730 fatalities and catastrophic damage. Tropical Depression 26W formed northwest of Saipan on September 2. The depression moved north and dissipated on September 3, without making landfall. Tropical Depression 27W formed on September 3 near Ponape as a 30 mph (48 km/h) depression. 27W quickly strengthened and was given the name Sally the same day. Rapid strengthening occurred as Sally moved west, reaching typhoon status by September 4, super typhoon status by the 6th and its peak intensity of 895 mbar with 195 mph (314 km/h) winds, becoming the strongest typhoon of the season on the 7th. Sally made landfall in Philippines on the 9th as a Category 5 typhoon. Weakening occurred and made landfall in China as a 115 mph (185 km/h) typhoon on the 10th, dissipating over land the same day. Tropical Depression 28W formed on September 7, never reached tropical storm status, and dissipated the same day as forming. The location of this depression is unknown. A tropical wave formed between Saipan and Iwo Jima on September 12. The wave strengthened and was given the designation 29W on the 13th. Rapid strengthening occurred and the depression became Tropical Storm Tilda the same day. By the 15th, Tilda was a 105 mph (169 km/h) typhoon. Tilda made landfall in China and weakened slightly on the 16th of September. Tilda reached water again and re-strengthened to a 130 mph (210 km/h) typhoon. Tilda made landfall on the 23rd in Vietnam, dissipating over land. The 30th tropical depression formed on September 14 in the South China Sea. The depression quickly strengthened and was given the name Violet within six hours. Violet reached typhoon status the next day and made landfall in Vietnam, dissipating over land. Tropical Depression 31W formed on September 15, never reached tropical storm status, and dissipated the same day. The location of this depression is unknown. Super Typhoon Wilda, having started on September 19 and reaching a peak of 175 mph (282 km/h) on the 21st, steadily weakened after its peak. It turned northward and northeastward, and made landfall on southern Japan on the 24th as a 115 mph (185 km/h) typhoon, and became extratropical the next day. Wilda left 42 dead or missing from its heavy flooding. The 33rd depression of the season formed near Vietnam on September 24. The depression strengthened into Tropical Storm Anita the next day. Anita's strength changed rapidly on the 25th and 26th, reaching its peak intensity of 60 mph (97 km/h) on the 26th. Anita dissipated over water on September 27. The 34th depression formed from a tropical wave west of Guam on September 25. The depression moved west, slowly strengthening to a tropical storm on the 27th. The storm made landfall in The Philippines the next day and peaked at 70 mph (113 km/h) the day after. Billie dissipated over water on October 1. Tropical Depression 35W formed on October 2 near The Philippines. The depression became Tropical Storm Clara the same day. Clara moved westward and gained strength slowly, reaching typhoon status on October 4 near The Philippines. Clara made landfall in Samoa on the 5th after it reached its peak at 90 mph (145 km/h). The storm continued westward and made landfall in Vietnam, dissipating after landfall on the 8th. Forming on October 6, Typhoon Dot hit northern Luzon on October 9 as an 80 mph (129 km/h) storm. It continued northwestward, and reached a peak of 100 mph (160 km/h) before hitting near Hong Kong on October 13, becoming the second typhoon to cause sustained hurricane winds in Hong Kong in the same season. Up to this date 1964 was the only year in which two typhoons caused sustained hurricane winds in Hong Kong in the same year. Dot dissipated quickly, after leaving 36 dead or missing, with 85 people injured from the typhoon. Tropical Depression 37W formed west of Kawalein on October 8, peaking at a 50 mph (80 km/h) tropical storm and was given the name Ellen. Ellen dissipated on October 10 near Ponape. Tropical Depression 38W formed on October 15 near Wake Island. The depression strengthened into Tropical Storm Fran soon later. The storm peaked at 60 mph (97 km/h), the storm made a curve to the north and dissipated on October 17. Tropical Depression 39W formed west of the Philippines on October 20. During the formative stage, 39W crossed paths with the active Tropical Depression 40W. The depression stormed westward, reaching storm status on the same day and received the name Georgia after landfall in the Philippines. Georgia continued to move westward peaking at 45 knots and made landfall in Vietnam on October 23. Georgia dissipated over land. Tropical Depression 40W formed northeast of Truk on October 20. The depression moved west and soon crossed paths with the soon-to-be Tropical Storm Georgia. 40W threatened both the islands of Yap and Ulithi on the 23rd. The depression dissipated on October 24. Tropical Depression 41W formed near Guam late on October 23. The depression gained strength and was given the name Hope within six hours. Strengthening occurred slowly and Hope reached typhoon intensity on October 27. The storm peaked at 85 mph (137 km/h) winds on the 28th near Chichi Jima. The storm weakened over water and became extratropical on the 30th near Japan. Tropical Depression 42W formed on October 30 and lasted for several days over water. 42W dissipated on November 4, never reaching tropical storm status. The location of this depression is unknown. On November 1, the JTWC began monitoring a tropical disturbance over the South China Sea, near the western Philippines. The following day, the system quickly organized as it moved in a general eastward direction. During the afternoon, the JTWC issued their first advisory on the system, immediately declaring it Tropical Storm Iris. After briefly taking a northeasterly track, Iris turned towards the southeast and reconnaissance planes recorded a developing eyewall. The following day, the a pressure of 1000 mbar (hPa) was recorded in the center of the storm; however, this reading was not taken at the storm's highest intensity. On November 4, Iris intensified into a minimal typhoon, attaining winds of 120 km/h (75 mph) and featured a circular 18 mi (29 km) wide eye. Several hours later, the storm made landfall in central Vietnam at this strength. Rapid weakening took place shortly thereafter, with the storm dissipating late on November 4 over the high terrain of Vietnam. Typhoon Iris brought significant rainfall to parts of Vietnam, resulting in significant flooding. However, a few days after Iris moved through the country, Typhoon Joan worsened the situation significantly. The deadliest storm of the 1964 season, Typhoon Joan brought heavy flooding that killed 7,000 people in Vietnam. Similar to the formation of Typhoon Iris, Typhoon Joan originated from a tropical disturbance over the western South China Sea on November 5. Tracking eastward, the system quickly organized and was immediately declared a tropical storm on November 6. Early the next day, a reconnaissance plane recorded a pressure of 1000 mbar (hPa), the lowest in relation to Joan; however, this was measured while the system was a minimal tropical storm. Continued development took place over the following day as a well-defined wall cloud developed within the system. Joan attained typhoon intensity during the afternoon of November 8 and reached its peak intensity with winds of 130 km/h (80 mph) shortly thereafter. Typhoon Joan made landfall in nearly the same location as Typhoon Iris in central Vietnam before rapidly weakening over land. The system eventually weakened to a tropical depression on November 9 before dissipating over Laos. Due to the rapid succession of Typhoons Iris and Joan, widespread flooding and catastrophic flooding was reported across central Vietnam. Roughly 90% of structures in three provinces were damaged by the storms and nearly one million were estimated to have been left homeless. Military operations during the Vietnam War were suspended by the typhoons. A tropical wave was spotted off Vietnam on November 12. The wave became Tropical Depression 45W on the 13th. The depression quickly strengthened into Tropical Storm Kate the same day. Kate made a curve to the west as a 60 mph (97 km/h) tropical storm. Kate strengthened into a typhoon on the 15th and a peak at 90 mph (145 km/h) winds the next day. Kate made landfall over Vietnam on the 17th, dissipating over land. The monsoon trough spawned Tropical Depression 46W on November 15 east of the Philippines. It moved westward, reaching tropical storm status later on the 15th and typhoon status on the 16th. Louise rapidly intensified, and peaked at 190 mph (310 km/h) on the 18th. The super typhoon weakened slightly to 160 mph (260 km/h) before hitting the southeast Philippines on the 19th. Louise dissipated over the archipelago on November 20, after causing 595 fatalities. Forming from the remnants of Louise, Tropical Depression 48W formed on November 21 near The Philippines. The depression made landfall in the Philippines just after forming. The depression was finally given the name Marge on the same day. Marge quickly strengthened to a 65 mph (105 km/h) tropical storm the next day. Weakening occurred and Marge dissipated over water on November 24. Tropical Depression 47W formed on November 19, never reached tropical storm status, and dissipated on November 20. The location of this depression is unknown. The 49th tropical depression formed near the Philippines on November 27. The depression brushed the area and strengthened into Tropical Storm Nora. Nora quickly weakened into a depression and dissipated the next day, peaking at only 65 mph (105 km/h). Tropical Depression 50W formed on December 5, never reached tropical storm status, and dissipated the same day. The location of this depression is unknown. 50W was tied for the shortest living system of the season with 23W, 28W and 31W. A tropical wave formed off the coast of Kosrae on December 8. The wave strengthened and was declared Tropical Depression 51W near Chuuk late the same day. 51W quickly strengthened into a tropical storm and was given the name Opal. Rapid strengthening occurred and Opal was a typhoon by the next day near Chuuk. Opal strengthened again into a super typhoon the next day, reaching its peak intensity of 195 mph (314 km/h) winds and a minimum pressure of 895 mbar. Opal grazed the Philippines as a Category 5 super typhoon on the 13th. Opal quickly weakened and dissipated near Hong Kong on the 16th. Tropical Depression formed near the International Date Line on December 10. The depression moved to the west and soon made a curve to south. 52W dissipated on December 12 near the island of Nauru. The name Tilda was removed from the list after this year. Therese is the name to replace and was first used in the 1967 season. The Philippine Atmospheric, Geophysical and Astronomical Services Administration uses its own naming scheme for tropical cyclones in their area of responsibility. PAGASA assigns names to tropical depressions that form within their area of responsibility and any tropical cyclone that might move into their area of responsibility. PAGASA uses its own naming scheme that starts in the Filipino alphabet, with names of Filipino female names ending with "ng" (A, B, K, D, etc.). Should the list of names for a given year prove to be insufficient, names are taken from an auxiliary list, the first 6 of which are published each year before the season starts (in this case, all of them are used up and more auxiliary names are given). All of the storm names here are used for the first time (and only, in case of Dading). The names not retired from this list will be used again in the 1968 season. After the season, the name Dading was retired due to its impacts and was replaced by Didang. 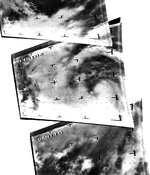 ^ "1964 Summary of Tropical Cyclones (JTWC)" (PDF). Archived from the original (PDF) on 2011-06-06. Retrieved 2009-12-24. ^ a b c d Joint Typhoon Warning Center (1965). "Typhoon Tess Summary" (PDF). United States Navy. Archived from the original (PDF) on 2011-06-06. Retrieved March 11, 2010. ^ a b Joint Typhoon Warning Center (1965). "Typhoon 01W (Tess) Best Track". United States Navy. Retrieved March 11, 2010. ^ "Viola Report" (PDF). Archived from the original (PDF) on 2011-06-06. Retrieved 2009-12-24. ^ a b "Storm Rips Hong Kong". Reuters. The Spokesman-Review. May 29, 1964. p. 20. Retrieved August 7, 2011. ^ "Typhoon Ends Long Drought In Hong Kong". Associated Press. The Evening Independent. May 28, 1964. p. 2A. Retrieved August 7, 2011. ^ "Winnie Report" (PDF). Archived from the original (PDF) on 2011-06-06. Retrieved 2009-12-24. ^ Staff Writer (2006). "Philippine Disasters". Disaster Database. Retrieved September 27, 2009. ^ Staff Writer (July 3, 1964). "Philippine Death Toll in Typhoon Hits 89". Chicago Tribune. Retrieved September 27, 2009. ^ Staff Writer (July 2, 1964). "Typhoon, Leaving 43 Dead, Heads Northwest of Luzon". The New York Times. Retrieved September 27, 2009. ^ Staff Writer (July 2, 1964). "Toll of dead rises to 44 from typhoon". Chicago Tribune. Retrieved September 27, 2009. ^ Henry Hartzenbusch (June 30, 1964). "Manila Storm Kills 10". Ellensburg Daily Record. Retrieved September 27, 2009. ^ United Press International (June 30, 1964). "At least 10 dead as typhoon sweeps over Manila". The Bulletin. Retrieved September 27, 2009. ^ United Press International (June 30, 1964). "Typhoon Winnie Kills 10 In Philippine Blow". The Deseret News. Retrieved September 27, 2009. ^ "Alice Report" (PDF). Archived from the original (PDF) on 2011-06-06. Retrieved 2009-12-24. ^ "Betty Report" (PDF). Archived from the original (PDF) on 2011-06-06. Retrieved 2009-12-24. ^ "Cora Report" (PDF). Archived from the original (PDF) on 2011-06-06. Retrieved 2009-12-24. ^ "Doris Report" (PDF). Archived from the original (PDF) on 2011-06-06. Retrieved 2009-12-24. ^ "Elsie Report" (PDF). Archived from the original (PDF) on 2011-06-06. Retrieved 2009-12-24. ^ "Flossie Report" (PDF). Archived from the original (PDF) on 2011-06-06. Retrieved 2009-12-24. ^ Associated Press (July 27, 1964). "Typhoon Piles Up Navy Ships". Sarasota Journal. p. 2. Retrieved January 31, 2010. ^ Staff Writer (July 30, 1964). "Seoul". Reading Eagle. p. 17. Retrieved January 31, 2010. ^ "Helen Report" (PDF). Archived from the original (PDF) on 2011-06-06. Retrieved 2009-12-24. ^ "Ida Report" (PDF). Archived from the original (PDF) on 2011-06-06. Retrieved 2009-12-24. ^ "JTWC Summary Report Chapter 4" (PDF). Archived from the original (PDF) on 2011-06-06. Retrieved 2009-12-24. ^ a b Joint Typhoon Warning Center (1965). "Typhoon Iris Summary" (PDF). United States Navy. Archived from the original (PDF) on 2011-06-06. Retrieved March 11, 2010. ^ Joint Typhoon Warning Center (1965). "Typhoon 43W (Iris) Best Track". United States Navy. Retrieved March 11, 2010. ^ a b Associated Press (November 16, 1964). "Another Typhoon Descends on Flood Stricken Vietnam". The Milwaukee Journal. p. 2. Retrieved March 11, 2010. ^ a b Joint Typhoon Warning Center (1965). "Typhoon Joan Summary" (PDF). United States Navy. Archived from the original (PDF) on 2011-06-06. Retrieved March 11, 2010. ^ Joint Typhoon Warning Center (1965). "Typhoon 44W (Joan) Best Track". United States Navy. Retrieved March 11, 2010.